Having had plenty of notice, we had been learning new material over the spring and were really looking forward to have the opportunity to perform it. Cue a decidedly un-alto shriek from Emily and Amo! Fortunately it was only a minor bovine delay and shortly afterwards everyone arrived at Treowen Manor house. This 17th century manor house is a spectacular venue and we were very excited to be singing there – not only is the building over 400 years old and the views from the grounds stunning, it has also been used for filming Doctor Who! We set ourselves up in the Banqueting Hall (!) and got warmed up ready to sing. Then as the wedding party finished their photographs, we embarked on our set. We had spent a few weeks learning ‘Joyful Joyful’ from Sister Act 2 (Back in the Habit) as requested by the bride and groom, so opened our set with this. Learning this song has been a challenge as the style is different from lots of the rest of our repertoire, but we pulled it off – with big congratulations to the choir members who had solos at the end of the song! From here we moved through the rest of our set which included some more soppy songs (as we were at a wedding after all) as well as other new numbers such as The Weeknd’s ‘I Can’t Feel My Face’ which was thoroughly enjoyed by all! 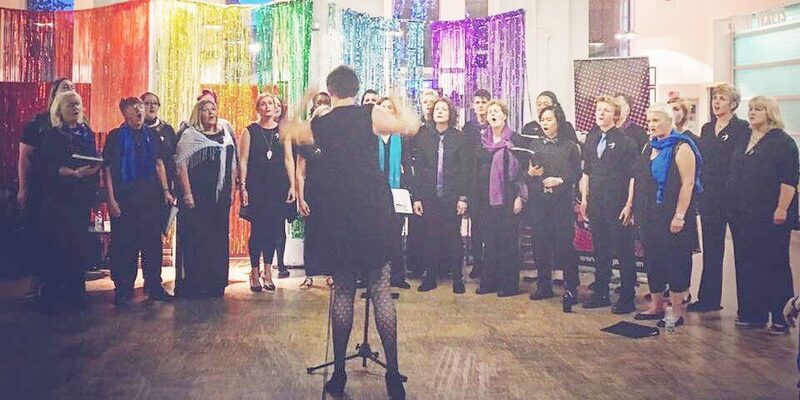 After a more mellow a capella section we finished with Regina Spektor’s ‘You’ve Got Time’ which we learnt last year for Cardiff Pride – watch this space as we are to perform there again later this year. Our set was well received and guests were dancing and singing along which was great to see! A big thank you to Rosie who worked so hard preparing us for the concert and also to Daniel our accompanist for helping deliver a really solid performance. Not to miss out on the opportunity of being in such a beautiful venue, we took a couple of photos of the choir before relaxing post performance with a round or two of crazy golf and a wander round the ground of the manor. We were really pleased with our performance and had a great time singing, relaxing and enjoying the day. Thanks to Jaime and Alex for inviting us! We rehearse every Wednesday from 7.15 at City United Reformed Church on Windsor Place, Cardiff.